With sadness and gratitude for a life well-lived, Sinclair announces of the passing of former Chairman of the Sinclair Board of Trustees, Mr. James W. McSwiney on June 21, 2016, at the age of 100. 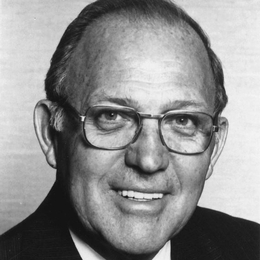 For more than 20 years, Mr. McSwiney dedicated himself to serving Sinclair and our surrounding community as a member of the Board of Trustees from 1964-1985. As Chairman of the Mead Corporation, Mr. McSwiney was one of the most influential members of our community for decades and used his influence to help create, sustain, and ultimately grow Sinclair into an outstanding community college. Famously, Mr. McSwiney kept a telescope in his office at Mead Tower that he used to keep an eye on the construction of the downtown Dayton campus. Quite literally under his vision, he played a critical role in the creation of the downtown Dayton campus, which opened for classes in 1972. Working with Sinclair Presidents Marvin Knudson and David Ponitz, he was instrumental in positioning Sinclair to be the national leader that it is today. He served on all board committees during his tenure including Finance, Development, and Facilities and as chair from 1974-1985. In honor of his extraordinary service to Sinclair and to the Dayton Region, Building 10 on the downtown Dayton campus was named for him in 1983. Mr. McSwiney lived a life full of achievement and service to others. His love for Sinclair and his passion for his community made a truly positive impact. President Steven Johnson, on behalf of all at Sinclair, lauds his lifetime of service and asks that we keep his family and many friends in our thoughts as we continue his life’s work at Sinclair.